When you think of restaurants that tout locally-sourced products, McDonald’s almost certainly does not come to mind. But the fast food behemoth is constantly adjusting its image, and part of that is getting in on farm-to-table food culture as much as a billion-dollar corporate burger machine can. That's why, recently, McDonald's announced it would sell garlic fries at four locations around San Jose, California, just 30 miles from Gilroy, California — the Garlic Capital of the World. And in the thick of garlic country, the limited-run product proved popular. Too popular, in fact, since McDonald's announced they actually exhausted all their garlic fry-making supplies. Our #GilroyGarlicFries were such a hit that we have a temporary shortage of supplies. We'll keep you updated on their return in a few weeks! "The new fries are made-to-order in McDonald’s kitchens where restaurant employees toss French fries in stainless steel bowls with a purée mix that includes ingredients, such as chopped Gilroy garlic and olive oil, parmesan cheese, parsley and a pinch of salt. The garlic fries are part of a trend at McDonald’s to experiment with regional flavors and food on its menu." "Includes ingredients such as" and "regional flavors," but not regional products? Not exactly airtight. Hang on, my tinfoil hat is slipping. Okay, the more likely answer is that, like with many promotional items used to boost publicity, McDonald's knew exactly how limited the run would be and is using the so-called shortage to garner further interest. And yes, the press release goes on to talk about the farm where garlic is from. Fine. I just prefer the conspiracies. 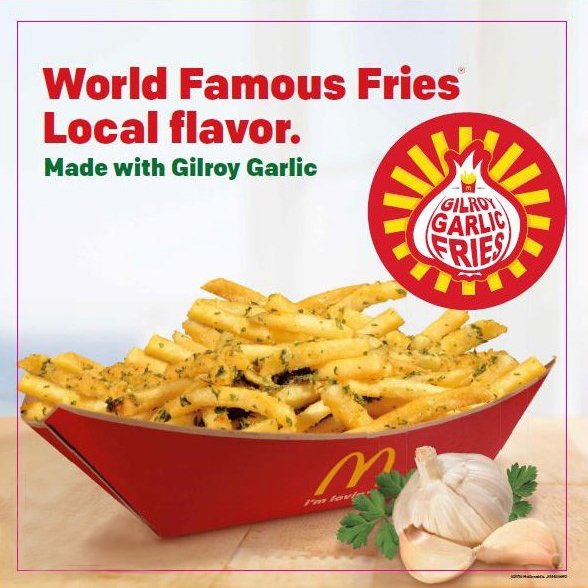 McDonald's has also said with the success of the Gilroy garlic fries, the popular item may get rolled out into all of the chain's Bay Area locations. While you wait around for Mickey D's to get it's golden-arched act together, you could always make your own delicious garlic fries anytime you damn well please. Hey, you could even just add garlic a large order of fries from the drive-thru. No judgment.